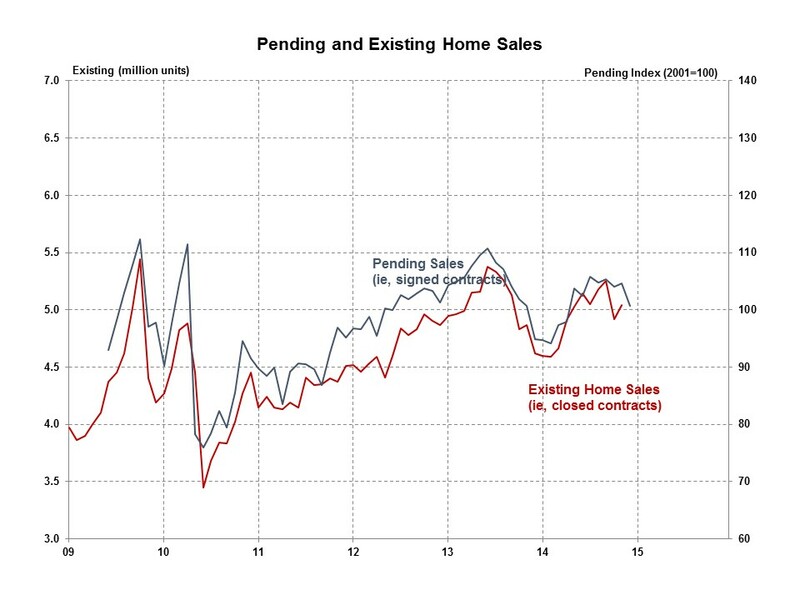 The Pending Home Sales Index decreased 3.7% in December, but was up 6.1% from the same period a year ago. The Pending Home Sales Index (PHSI), a forward-looking indicator based on signed contracts reported by the National Association of Realtors (NAR), decreased to 100.7 in December, down from a downwardly revised 104.6 in November. The PHSI also declined sharply in December 2013. The December PHSI decreased in all four regions, ranging from 2.6% in the South to 7.5% in the Northeast. Year-over-year, the PHSI increased in all four regions, ranging from 8.6% in the South to 1.9% in the Midwest. Last week NAR reported a 2.4% increase in December existing home sales, and December existing sales were up 3.5% from the previous December. Firming job and economic growth suggests that the existing home market will demonstrate steady growth in 2015. The housing recovery has moved towards higher ground reflected by the strong uptick in December new home sales announced two days ago.